This is the first post in an experiment I am conducting where twice a month (hopefully), I post a short interview of a person whose work have a tinge or more of darkness about them (although I may branch out later), not about their work (because you can easily google those), but about their beliefs and experiences in the supernatural. I am honored to have Budjette Tan, one of the country’s best known comic book writers and whose well-crafted works of dark fantasy I admire. 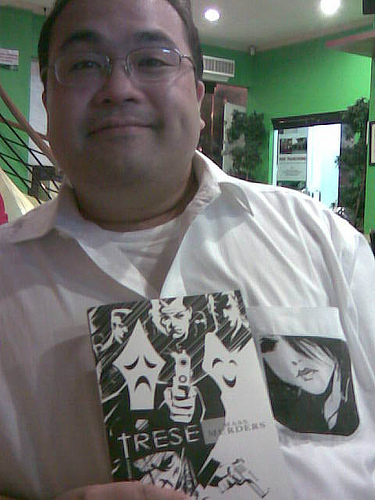 Alamat Comics co-founder Budjette Tan is nowadays known as the guy who created Trese, the comic book series that revolves around Alexandra Trese, a supernatural detective, a link between our world and the next. Now spanning three best-selling books, Trese has managed to capture the imagination of many Filipinos, who avidly follow Trese and the Kambal’s – her twin bodyguards – hair-raising adventures. He is also involved with Underpass, a graphic novel published under Summit Books. Yes, I do believe in such things. I have not really seen any supernatural creature or being, but my mother has told me enough stories to make me believe that they are real. When I was still a baby of four or five months old, we supposedly lived in a haunted house in Merville. Strange things would be seen and heard by my relatives, the maids, and the driver. They talked about lights being switched on and off, getting calls on the intercom from rooms where there were no people, slippers moving by themselves, sights a young lady seen in the backseat of the car as the driver was backing out of the driveway. My mom and dad didn’t believe in such things. And then, one summer afternoon, after my mom gave me a bath, she noticed that the right side of my face wrinkled up like that of an old man. My right eye stared at her in defiance. She slapped my right cheek and commanded the spirit to leave me. And even though she slapped me hard, I did not cry but just stared back at her. She ended up praying the entire rosary before my face returned to normal. When I was in college, strange things also started happening in our house in La Vista, Quezon City. I was abroad at the time all this happened and my mom called me up long distance just to tell me what they saw. It was after dinner, my mom and dad sat at the lanai facing the garden – where we would see the usual moth fluttering near the spotlights and the occasional bat swoop down to munch on the moths. That night, a winged creature flew downwards and instead of flying back up into the dark sky, it stopped and hovered in front of the spotlight that lit the garden. The wings were attached to what looked like a human head that had no eyes, nose, or mouth. And where the ears should’ve been, the flesh-colored wings sprouted from the head and fluttered and kept itself floating. Before my mom and dad could do anything, the head vanished. And even though I was halfway around the world, sitting in a brightly lit room in the middle of the afternoon, I found myself scared to look out the window. The Head was later seen by our cook and another maid. It was seen rolling, bouncing on the wall behind the kitchen. At the time, the Spirit Questors were getting a lot of press. So, we invited them to do a quest in our house. Through the Questors, we found out the Head was actually a duwende – that they have the ability to change shape and they do so to play around with people. We also found out that there were two tribes of duwende living on the perimeter of our house. The Brown Duwende lived in the garden at the back. They were the “good guys”. The Black Duwende lived in the shrubs at the front of the house. They were the “bad guys”. The two tribes were trying to dominate the inside of the house. Whenever the Brown tribe would win, good stuff happens to those in the house. Whenever the Black tribe would win, bad luck happens. Which might have explained why my father’s business would have good years and bad years, said the Questors. The Questors also met a diwata, who supposedly liked hanging around my mother and protected her from harm. The Brown duwende requested that we keep the garden clean. They didn’t like it when we didn’t sweep away the dead leaves. They also asked if we could give them seafood and sweets every 5pm, which we left at the foot of a particular tree. We followed these requests and didn’t see the Head anymore after that. Like I said, a lot of weird stuff has happened around me (seems like my mom is the magnet for weirdness), but I myself have not seen anything unusual. Probably, the only time I might have seen a ghost was when my father died. I slept in his room and when I woke up, I saw a shadowy figure seated at the couch. It was staring at me. It didn’t look like my dad. It was a thinner, slimmer figure. The figure vanished soon after I sat up and rubbed my eyes. Back in college, one of the urban legends we kept hearing about was the 13th house on 13 Street in New Manila. According to the story, a sale man / repairman / exterminator was called to the house. (The main character’s job changes, depending on who tells the story.) Even though he quickly found 13 Street, he could not find the house itself. After house #12, the numbering of the house would skip to #14. It was getting late and the sun was already setting. He was about to give up when he suddenly noticed that he was parked right in front of house #13. He rang the doorbell and an old lady opened the gate. The lady was so happy to see him, that he had finally arrived, and he was ushered into the dimly-lit house. The old lady supposedly showed him around the house and then wanted him to go to the basement. She said, she had prepared his favorite dish – adobo, supposedly. The lady smiled at the man and was trying to push him towards the door that lead downwards. The man panicked and gave some excuse about forgetting something in the car. He rushed out the door, out the gate and ran into his car and drove away as fast as he could. The next day, he realized he forgot something in the house. So, he drove back and could not find it anymore. One night, while hanging out at the 24-hour Mister Donut at Greenhills, one of the guys started telling this story again and after the story was told, we decided we just had to try and find the house for ourselves. And just like in the story, we could not find the 13th house. At a certain point, we just ended up scaring ourselves because a barking dog. We all jumped into the van and drove as far away as possible. We must’ve looked like the cast of Scooby-Doo that night. We never did go back. Maybe we should try to look for it after all these years. I guess that story of me as a baby is the scariest one I’ve been told. Based on the things we were told about the duwende tribe in our house, that became basis for how things worked in the world of Trese. I think the advice given to “what would you do if you encounter a rabid dog / a bear in the forest / a snake in your basement” applies to what you should do when you encounter a ghost or elemental : DON’T PANIC. DON’T PROVOKE IT. RUN AWAY AS FAST AS YOU CAN.